If you look at any two moving average crossovers in a trading chart, you see that at a turning point, the short moving average converges to the price and the long-term moving average converges, a bit later, to the short-term one. Similarly, after a crossover, the two moving averages diverge from one another. 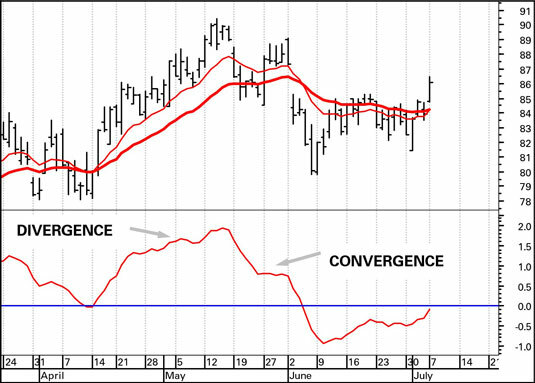 Convergence: When two moving averages converge, the trend may be coming to an end. Convergence is therefore an early warning. Because moving averages are always lagging indicators, measuring convergence is a way of anticipating a crossover. At a peak, one way to look at the convergence is to say that short-term demand is faltering — traders are failing to produce new higher closes. The trend is still in place, as shown by the long-term moving average. At a price bottom, you can interpret the short-term moving average falling at a lesser pace as selling interest (supply) falters. Divergence: Conversely, when you can see a lot of daylight between two moving averages, they’re diverging, and that means the trend is safe from a crossover, at least for another few periods. In practice, abnormally wide divergence tends not to be sustainable and can be a warning of prices having reached an extreme ahead of reversing. When the indicator line is rising, the two averages are diverging. When the line is falling, the averages are converging. At zero difference between the two averages, you have the crossover. You can verify this crossover by checking the actual moving averages on the price chart.